James Joll published his book The Anarchists almost half a century before the first suicide bombing in the Middle East. But his description of the indiscriminate violence of some of the anarchists of the 19th century fits the calibrated callousness of suicide bombers, especially of the Iraqi kind. Joll called the throwing of a bomb into a crowd of ordinary citizens, as happened in Spain in 1892, ‘an act of frightening impersonality.’ The suicide bomber seeks vulnerable victims. He detonates his bomb on a crowded bus or in a busy market. He usually targets civilians and not combatants. The suicide bomber may not be as courageous as his act of shattering self-dissolution suggests. The assassins and some anarchists of the past were different. They attacked the king and not his subjects. Some of the assassins, like the Middle East suicide bombers, were religious fanatics. Jacques Clement, a crusader for the Catholic faith, stabbed Henry III of France to death on August 1, 1589. He had been told he would be warmly welcomed by Saint Peter at the portals of paradise. Henry IV, his successor, was also stabbed to death. The man who killed the king on May 14, 1610 was named Francois Ravaillac, another fervent, furious fundamentalist. Karl Eduard Nobiling, a doctor of philosophy, tried to kill Wilhelm I of Prussia on June 2, 1878. His means and method of attack anticipated Lee Harvey Oswald’s shooting of President John Kennedy at Dallas on November 22, 1963. Nobiling fired at the king, who was being driven in an open carriage, from an upstairs window. The king was hit but not killed. Nobiling shot himself as the police and some ordinary citizens rushed in to arrest him. He was still conscious and made a defiant speech, not unlike the testamentary videos of Palestinian suicide bombers. He became unconscious after making his speech and denied the elderly king the satisfaction of having him hanged. Those who tried to kill Napoleon Bonaparte on December 24, 1800 used a bomb. The bomb was concealed in a cart, but the cart was not used to ram Napoleon’s carriage, as Hezbollah suicide bombers did with their bomb-laden trucks at the American and French barracks in Beirut in 1983. The Beirut bombings killed almost 250 American soldiers and 58 French troops. Napoleon, who was going to the opera, escaped without a scratch, but many people were killed. The leader of the bombers was Felice Orsini, an Italian nationalist. He and many Italians chafed under Austrian rule. Orsini believed Napoleon III was indifferent to the political strangulation of Italians by Austria. Orsini himself had been jailed by the Austrians and published a book about it, Austrian Dungeons in Italy. Orsini and his two companions threw bombs at the emperor’s carriage, but the emperor and the empress were not among the eight people killed. 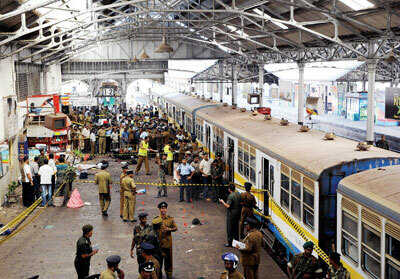 About 160 people were injured. France went to war against Austria over Italy a year after Orsini was beheaded on March 13, 1858. Napoleon III was at the head of his army and the French and Italian forces defeated Austria. Ignatei Grinevitski belonged to a group like Hamas. It was called Narodnaya Volya or People’s Will and the group wanted more freedom for the Russian people. One of the group’s leaders was a person of privilege like Orsini. Her name was Sophia Perovskaya, a daughter of the governor of Saint Petersburg. People’s Will narrowly missed killing Tsar Alexander II on a few occasions. The secret police cracked down on its members, but did not employ the cruel tactics of the Spanish police. The Spanish police planted bombs, which killed and maimed many people, and blamed it on the anarchists. The agents of General Sani Abacha did the same thing in Nigeria. They got the tsar on March 1, 1881. He would have been safe if he had not come down from his carriage to see the seriousness of the injuries suffered by some of the soldiers accompanying him on horseback. Grinevitski threw a bomb at the tsar, who was not a cruel ruler, and he was mortally wounded. The blast also killed Grinevitaski, making him an accidental suicide bomber. The first suicide bombing in the Middle East, according to Professor Avishai Margalit, an Israeli, in an article in The New York Review of Books, was in November 1982 in Tyre, Lebanon. Alexander the Great had destroyed Tyre to conquer it, but the Hezbollah suicide bomber believed he was saving Tyre by blowing himself up in a building. But the building was not empty; it was teeming with Israeli soldiers and 76 of them were killed. The LTTE of Sri Lanka got in on suicide bombing before the Palestinians did. Thenmuli Rajaratnam killed Rajiv Gandhi, former prime minister of India, on May 2, 1991. The first Palestinian to explode his bomb of self-immolation and massacre did so in April 1993, according to Nasra Hassan, a Pakistani, in an article in The New Yorker. The attack was in the West Bank, occupied by Israel since 1967. Hassan, a senior United Nations official who had worked in the Gaza Strip, interviewed some suicide bombers in training, people willing to sacrifice their lives to cause sorrow in many homes. But it appears from her article that it is not every ‘volunteer’ that boldly seeks martyrdom. Some of them have to be recruited and cajoled. There is brainwashing, though many suicide bombers, according to Hassan, were well educated. Like Orsini and Perovskaya, the 19th century bomb throwers, some of the Palestinian suicide bombers came from comfortable homes. Volunteers are not allowed to change their minds, are prevented from choosing life over self-liquidation. Writes Hassan: ‘During the week before the operation, two “assistants” are delegated to stay with the potential martyr at all times. They report any signs of doubt, and if the young man seems to waver, a senior trainer will arrive to bolster his resolve. ‘Why do some people volunteer for suicide bombing? It is hard to say in the case of Iraqi suicide bombers. Arabs are killing Arabs. Sectarianism seems an inadequate explanation for the casual and constant slaughter in Iraq. Shiites and Sunnis are killed when a suicide bomber detonates his bomb in a crowded market. Are some suicide bombers like serial killers, twisted people who love killing? Some serial killers deliberately leave clues that lead to their arrest, something akin to the suicide bomber detonating his bomb belt.